More than 100 attend European "Mega Clinic"
More than 100 musicians from Belgium, the Netherlands and France attended the second edition of the DCE/Dynasty Mega Clinic on April 19 and 20 in Ede, the Netherlands. Clincians Rich Viano, Scott Boerma and Bob Thomas led the clinic sessons in Ede, along with four European clinicians from the Percussion Projects organization. 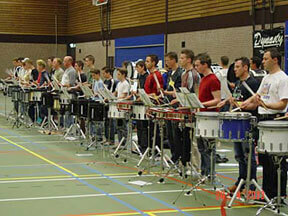 European drummers learned from American instructors at Mega Clinic. The attending musicians were very enthusiastic about what they learned during the weekend. Instead of studying music pieces, the focus during the clinic sessions was on technique, which was highly appreciated by the participants. On Sunday, corps instructors were invited to attend an instructors' clinic led by Bob Thomas. At the end of the Mega Clinic, all sections presented some exercises and music they had worked on, while the clinicians explained the purpose of the exercises that were played. The DCE/Dynasty Mega Clinic was organized by Drum Corps Europe, in conjunction with Dynasty USA, Percussion Projects, Showband Irene and Muremo NV Belgium.